My friends know that I get on a kick where I’m just absolutely positive that such-and-such piece of furniture or change to my house will just make it perfect and end all my troubles forever. Usually, the way this plays out is that I do some online shopping, decide it’s all too expensive to buy sight-unseen, and forget about it until the next “this-will-solve-all-my-problems” obsession comes along. But this time was different. This time, I actually bought it. And this time, I really DO think it will solve all my problems. I ordered the Coaster Storage Ottoman with Tufted Accents from Amazon, and it is such a multi-purpose, smart furniture choice. I’m stoked. 1. It gives us a place to put up our feet when we stay up watching Netflix after our boys are in bed. 2. It has a TON of room to store all those tiny toys we’re constantly stepping on. 3. It is the right height (and length) to use at the dining table when we have a big family dinner. 4. It’s beautiful and adds some visual weight to that side of the living room. And now, the best part! The price! I mean, seriously? Amazing, right? With my Amazon Prime membership, the ottoman shipped for free. I ordered it on Friday and it came on Monday! I was also VERY impressed with how well it was packaged. There was some assembly required, but the directions and process were so easy. Even Isaac could have figured out how to screw the beautiful feet on. The ottoman is sturdy and spacious enough for two of us to sit on (if we decide to pull it up to the table for dinner) and the lid has those fancy hinges that keep it from slamming shut on my sweet monsters boys. Great price + great function + incredibly beautiful = no online buyer’s remorse for me! I started this post last week, when we were forecasted to have a big blizzard. The meteorologists talked about it for days, and then we got a dusting of snow. Today, we’re in another blizzard. This one was supposed to stay far south of us. It didn’t. When “they” predict a big storm, we do what everyone else does…we make sure the fridge is stocked, take care of any other errands, and prepare to hunker down. But the fact that we have 40,000 (and sometimes 60,000) turkeys in our care adds a whole ‘nother dimension to storm preparation. How does Bartastic make sure his turkeys will be okay during a storm like this? 2. Check LP levels. LP is short for liquified petroleum, which powers our generators. 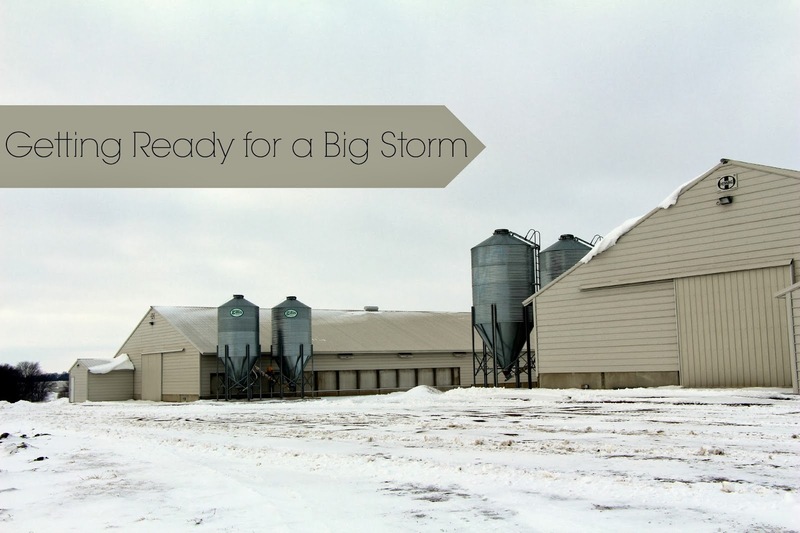 In a winter storm, LP trucks would have a hard time getting to us if we were to run out. 3. Prepare the machinery. The skid loader is in charge of clearing snow. Bart fueled it up so that he would be ready to clear our driveway, the driveways to the barns, and even our gravel road if need be. When we get a lot of snow, he uses the skid loader as his main method of transportation, and has even dug out the neighbors a time or two. 4. Check feed levels. Some farms mix their own feed on site, but ours comes from a feed mill that specializes in turkey feed and is located 20 miles away. Bart makes sure that our feed bins are as full as possible, in case the feed trucks are unable to make it to our place. 5. Make sure he has all supplies on hand. Bart always has extra parts for water lines and feed lines, and he also checks his supply of sanitation products. If you follow along on Facebook, you might already know that we are currently battling our first ear infection. Neither of my boys had ever had one until Isaac (almost 2) ended up with a double ear infection earlier this week. Since I’m still recovering from the sleep deprivation caused by those darn ears of Isaac’s, I was having trouble remembering whether he’d had the proper dose. So I made a quick grid on the bottle with a sharpie – 10 days, 2x a day – and I’ll know exactly when to stop, too (which is much harder than it sounds.) And don’t forget to attach your marker with a rubber band, so that the little stinker doesn’t get ahold of it and try to make a grid on the walls. I picked up this door a couple of months ago when I was out picking for The HomeShed, and I fully intended to sell it. But…then, I moved the cabinet that had been in this corner to another part of the house. And all of the sudden, the corner was so empty and the room felt off balance. And so, the door has found a new home, nestled in next to my beloved turquoise chairs. - The dark wood and straight lines add some masculinity to the room. I love a good, frilly, shabby chic room, but let’s face it. I live with three boys. Our home will never truly reflect “us” if it’s too feminine. My knock-off pouf has the same effect – add a little masculinity to the feminine wing-backs. - The hinges are so beautiful and detailed. Have you ever seen anything more lovely? What do you think? Do you love the “new” door as much as I do? Alright, ladies and gents…I think it’s time that I let you know the ins and outs of my blogging behavior. I have been blogging regularly for 3 years now, and have learned a lot about what works for me and my blog along the way. These “secrets” are not the keys to having the most popular blog on the block and they probably will not help you become a professional blogger. But neither of those things are really my goal. -to share positive information about agriculture – specifically about my farm and other farms like mine. -to connect with those who share a passion for home décor. -to share what I have learned about children (and teaching and parenting) through my experience and research, in order to make other moms’ lives easier. With those three broad topics in mind (kids, farming and home) I am constantly thinking of blog post ideas. I do a lot of “mental prewriting” where I rehearse the post in my head while showering, snuggling my munchkins, driving, etc. When I finally get a chance to sit down at the computer AND I’m in the mood to write, I usually start a few rough drafts and save them. At any time, I have 5-15 rough drafts sitting and waiting for me, and a few more ideas floating around that I haven’t even drafted. Later, I sit down with the intent to finish a draft and get it posted. This involves editing and revising my writing, as well as editing and inserting photographs. I think my blog took a turn for the better when I realized last spring that I am a writer. I started using the good old fashioned writing process more and taking myself more seriously. Not only has my writing improved, but my confidence has as well. I use three main software programs to get my ideas out of my head and onto the blog. 1. Windows Live Writer: I downloaded this a couple of years ago and use it to write my blog posts. I use blogger and am happy with it, but writing posts online just about made me crazy. I could never get them formatted correctly and get my photos where I wanted them. Windows Live Writer came to my rescue. It’s a free download, and you connect it to your blog. It makes inserting photos and formatting blog posts 10,000x easier and even offers you a preview so you can see exactly what your post will look like on the page. 2. Memory Manager: This is a photo editing and organization program from Creative Memories that I absolutely love. There is absolutely no way that I could keep track of my photos or have them looking so good without it. I have done a few posts on editing and organizing photos using Memory Manager, but I need to update them. A new version came out and it is even better than before! 3. Storybook Creator Plus: SBC+ is another Creative Memories program that is meant for digital scrapbooking, but it is super flexible, so I use it to created all of my graphics (including my header, facebook profile photos, photos with titles for pinterest, etc.) I also use for my printables and word art, like the Laura Ingalls Wilder art found here. My blog is about things that I am deeply passionate about and I truly believe that is what has kept me going for 3 years. I have had slumps where I don’t post often, and times where I have so many posts that I have them scheduled for two weeks out. Creativity ebbs and flows, and I have learned to just go with it. My blog had the most traffic and pageviews when I was posting three times a week and really promoting it a lot through twitter and linky parties. But at this season in life, I don’t have the time or motivation to keep that up, and that’s okay for me. If my goal were to be a professional blogger, I would have to be much more disciplined about it, but that just doesn’t work for me and I’m okay with that. Three main categories is probably too many by most popular blog standards. Most narrow in on only one or two. But again, that just doesn’t work for me. My interest and attention to those three topics ebbs and flows, too, and I have learned to work with it. Whichever topic seems to be dominating my life at the time is the inspiration for my writing, and I’ll often draft several posts about parenting all at once, or several posts about the house, or several posts about the farm. I love blogging…the whole process. But without such a deep passion for farming, kids and houses, my blog would feel like work and I try to avoid that at all costs. The best part of blogging, though, is something that I have little control over – my audience. I love the people that I have “met” and the interactions we have over common interests and shared knowledge. I know that without that interaction, I never would have continued blogging through my “slumps” and my blog and I would not be what we are today. So thank YOU for your role in my blogging behavior – you have no idea how much it means to me!